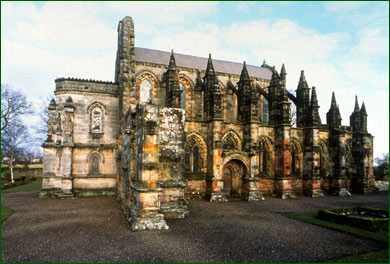 Rosslyn Chapel was begun in 1446 by Sir William St Clair, third and last Prince of Orkney, on land given to his family by King Robert the Bruce in appreciation for their support during the campaign to put Robert on the throne of Scotland. Building work stopped when Sir William died in 1484 and he was buried in the uncompleted Chapel. His son and heir, Sir Oliver St Clair roofed the Chapel but did nothing more to fulfill his father's ambitious plan. The much larger building Sir William had intended was never completed. What we see today represents only the choir of the much larger cruciform building. To apply the word 'only' to this building is to do it an injustice. Rosslyn Chapel is extraordinary and certainly unique. It bears testimony to the learning and piety of its creator. The Chapel survived intact until the Reformation when in 1589 it was described as a 'house and monument of idolatrie, and not ane place appointit for teaching the word and ministratioun of ye sacrements'. The local clergy were instructed not to carry out services of worship in the Chapel and burial was even refused to the wife of the current head of the family, Sir Oliver St Clair, in 1590. Sir Oliver was repeatedly warned to destroy the altars and when he didn't comply, in 1592 he was called before the General Assembly of the Kirk of Scotland and threatened with excommunication. This desecration of the Chapel was carried out and Rosslyn, ceasing to be a place of worship, fell into disrepair. During the English Civil War, in 1650 General Monk, who was campaigning in the area, stabled his horses in the Chapel. It is believed that Oliver Cromwell, a Freemason, stopped any further desecration of the Chapel. In 1688, soon after the Protestant William of Orange displaced the Catholic James II of England and VII of Scots, a mob from Edinburgh ransacked Rosslyn Chapel. They were intent on destroying furniture and vestments which were then regarded as Popish and idolatrous. They were probably looking for treasure as well, as the St Clair family had been guardians of the Scottish Treasure, including a fragment of the True Cross which was brought by Queen Margaret from Hungary and stored at Holyrood Abbey until removed by the St Clairs for safe keeping. The expected treasure trove was never found. The Chapel remained a ruin until Sir James St Clair glazed the windows in 1736. He had the roof repaired and the floor flagstones relaid. A boundary wall was also built at this time. From then on the Chapel was kept locked to preserve it from vandals. After further repairs, in 1861 Sunday services were begun again and the Chapel was rededicated in April 1862. The Chapel is still owned by the Sinclair (St Clair) family today and services of worship and weddings are regularly held there. In 1996, the Rosslyn Chapel Trust was set up as a registered charity to oversee the continuing restoration work and in 1997 a steel structure was erected to cover the roof of the Chapel. As predicted, this structure allowed the stonework to dry out and after 10 years, work could begin on stone conservation. A new roof covering of lead was put in place and the steel structure was finally removed in 2010. In 2003 the local Grand Herald of the Scottish Knights Templar (self-proclaimed successors to the warrior monks who found refuge in Scotland in the late 13th/early 14th centuries) said that they intended using modern technology to scan the chapel for ancient vaults that might contain the elusive Rosslyn treasure. Two such vaults were found using the latest radar techniques developed for archaeology. The first vault contained coffins and body armour. The second vault refused to give up its secrets, clogging the instruments in detritus time and again. After many abortive attempts to get the technology working, the project was abandoned, allowing the chapel to keep its secrets.